Action potentials are mediated by transient changes in ion conductance across the cell surface membrane. These changes in conductance are primarily mediated by ion channels. Ion channels are membrane-embedded proteins that selectively pass specific ions upon opening. Some ion channels are constitutively open; however, most channels open following stimulation, such as through voltage changes, intracellular messengers, neurotransmitters, or shear stress. In the heart, voltage gated ion channels, conducting sodium, calcium and potassium ions, are primarily important in generating and shaping the action potential as well as exchangers and pumps that contribute to ion fluxes. The most prominent features of the cardiac action potential is the synchronised depolarisation of all the cardiomyocytes and the very long lasting depolarisation period, which in humans lasts 200-450 ms, depending on the beating frequency. The electrical impulse is generated in the pacemaker cells in the sinoatrial node located at the junction of the superior vena cava and right atrium. The electrical signal spreads to the right and left atria, thereby initiating muscular contraction and resulting in additional filling of the ventricles. When the depolarisation reaches the atrioventricular node, conduction is slowed before the depolarisation progresses to the ventricular cardiomyocytes. The electrical impulse is spread to the ventricles through a specialised conduction system formed by the His bundle branches and the Purkinje fibres, resulting in the depolarisation of the ventricular cardiomyocytes within a relatively short time span. The very long cardiac action potential mediates a long lasting increase in cytosolic calcium and, thereby, a long lasting contraction. Furthermore, the long action potential duration makes the myocardium refractory, whereby under normal physiological conditions no new action potentials will disturb the ongoing contraction. After the depolarisation phase and the plateau phase, the myocardium repolarises such that the contraction cesses and the ventricular chambers can be refilled. Disturbances in this highly fine-tuned electrical-contraction pattern – termed arrhythmia – can be detrimental since unorganised electrical impulse propagation in the musculature will lead to uncoordinated muscle contraction and therefore a loss of pumping function (Jespersen, 2011). The cardiac action potential is the summarised output of several different types of ion channels. The functional significance of the different ion channels depends on both the subcardial location and the biophysical configuration of the channels, as well as the physiological demands to be fulfilled. This is illustrated by the fact that the action potential morphology differs whether it is recorded in nodal tissue, in atria or else in either the subendocardial or subepicardial myocytes in the ventricle. Fig. 1. Ionic currents shape the cardiac action potential. Illustration of a ventricular action potential and the underlying currents. Ion channels consist of a central protein, named the a-subunit, where ions pass through a pore. Cardiac sodium and calcium channel a-subunits are composed of a single protein constituting a functional channel, while the potassium channels are tetrameric complexes of either homomeric or heteromeric composition. The pore contains a selectivity filter which ensures, for most channels, a high selectivity of one ion over the others (Hille, 2001). The opening, closing and inactivation of the channels are managed in a number of different ways. The voltage-gated channels contain a voltage sensor – primarily located in transmembrane segment 4 – which detects voltage changes, thereby initiating a conformational change in the protein leading to the opening and closing of the channel (Gouaux & Mackinnon, 2005). The inactivation of channel conductance – which is important for the physiological functions of a number of the cardiac channels – can be induced either by fast intramolecular changes or by slower extramolecular regulation, such as through the binding of calcium ions to calmodulin, which interacts with the channel. A number of different classes of proteins interact with the cardiac ion channels. Closely associated proteins which are believed to be specific to the ion channels are termed P-subunits. P-subunits can regulate both surface expression and opening and inactivation kinetics (Isom et al., 1992). Many of these P-subunits have been suggested as being promiscuous since they can interact with several different a-subunits (Panaghie & Abbott, 2006). In addition to the P-subunits, a growing number of regulatory and scaffolding proteins have been found to interact with the different cardiac ion channel complexes. This topic will provide an overview of the major cardiac currents, the protein complexes constituting the ion channels and the regulatory mechanisms of these channels which are of crucial importance for controlling the progression, synchronisation and rhythmicity of the cardiac action potentials. The sinoatrial node, the atrioventricular node and the purkinje fibres all show spontaneous beating activity, but because the sinoatrial node normally has the highest frequency this is considered the primary pacemaker of the heart. The automaticity of the sinoatrial node is thus the basis for the rhythm and rate of the heart. 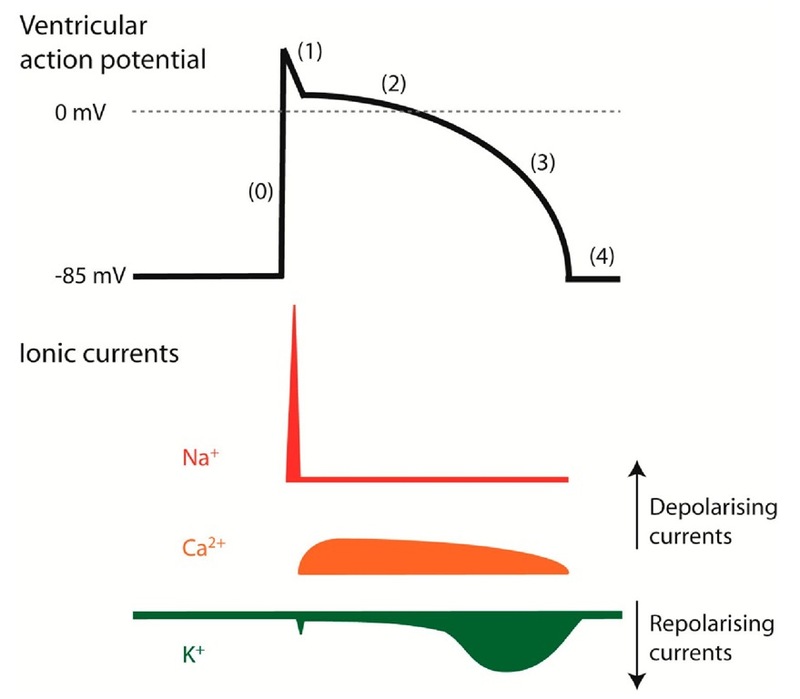 The nodal action potential is initiated by a slow increase in depolarisation – driven by a sodium influx – followed by a faster depolarisation due to a calcium influx and terminated by a potassium ion efflux (reviewed by Mangoni & Nargeot, 2008a). One of the important ion currents participating in generating the spontaneous impulse is the hyperpolarisation activated current If (f for ‘funny’), which is conducted through the hyperpolarisation-activated cyclic nucleotide-gated channels (HCN) of which four members are known (HCN1-4). HCN4 is the primary expressed pacemaker channel, but HCN1 and HCN2 are also present in the sinoatrial node (Marionneau et al., 2005; Moosmang et al., 1999; Moroni et al., 2001; Shi et al., 1999; Sizarov et al., 2011). HCN channels are permeable to both sodium and potassium (Xue et al., 2002). However, as the channels deactivate at depolarising potentials, the predominant conductance is an inward sodium current. These channels are activated by cyclic nucleotides and hyperpolarisation potentials negative to 55 mV (Gauss et al., 1998; Ludwig et al., 1998; Santoro et al., 1998). The one transmembrane spanning P-subunit, KCNE2 (MiRP1), has been reported to increase the surface expression and accelerate the kinetics of the HCN channels and has, therefore, been proposed as playing a role in generating the pacemaker signal (Macri et al., 2002; Qu et al., 2004; Yu et al., 2001). In the sinoatrial and atrioventricular nodes, the activation of the HCN channels leads to a gradual depolarisation. This depolarisation is counteracted by an acetylcholine-activated potassium current (IK,Ach) conducted through the G-protein coupled inward rectifier (GIRK) (Noma & Trautwein, 1978). The cardiac IK,Ach channels are heteromeric complexes consisting of Kir3.1 (GIRK1) and Kir3.4 (GIRK4) subunits (Wickman et al, 1999). The Kir3 channels are activated by various heptahelical receptors coupled to G proteins of the pertussis toxin class (Gi/Go). Upon receptor activation, the heterotrimeric G protein complex is dissociated in its a and 6y subunits, where the latter interacts with Kir3 subunits inducing an increased open probability of the channel complex (Logothetis et al., 1987). The activation of cardiac GIRK channels by acetylcholine, adenosine and ATP mediates a negative chronotropic effect (Friel & Bean, 1990; Kurachi et al, 1986a; Kurachi et al., 1986b; Medina et al, 2000; Ravens & Dobrev, 2003). Vagal stimulation activates cardiac muscarinic M2 receptors whereby IK,Ach increases. This results in a slowing of the depolarising phase of the sinoatrial action potential and thereby provides a reduced action potential frequency. In contrast, the sympathetic stimulation of p-adrenergic receptors in the sinoatrial node mediates a positive chronotropic effect by increasing the cAMP levels, which reduces the GIRK-mediated current and – at the same time – increases the activity of the HCN and Ca2+ channels (see below), whereby the diastolic depolarisation phase is shortened and the spike frequency is increased (Baruscotti et al., 2005; Bucchi et al., 2003; DiFrancesco & Tromba, 1988; DiFrancesco, 1993; Noma et al., 1980; Zaza et al., 1996). Although HCN and GIRK channel regulation is considered central to setting the firing frequency of the sinoatrial node, other ion channels, including the ryanodine receptors (calcium-activated calcium channels located in the sarcoplasmic reticulum), IST channels with unknown molecular correlates and voltage-gated sodium channels (probably of the neuronal type) have also been found to play a role (Lakatta & DiFrancesco, 2009; Mangoni & Nargeot, 2008b). The increasing depolarisation triggers the activation of T-type and L-type calcium channels (Fermini & Nathan, 1991; Hagiwara et al., 1988; Vuill & Hancox, 2002), whereby an action potential is generated. The repolarisation of the nodal cells is controlled by voltage-gated potassium channels. Both the rapid and slow inward rectifying current (IKr and IKs) as well as the transient outward current (ITo) are present, but further investigation is necessary to establish the relative and spatial importance of these currents (Mangoni & Nargeot, 2008b). As both the calcium and potassium currents play prominent roles in shaping the atrial and ventricular action potentials, they will be described below. Fig. 2. The major ion channels responsible for the ventricular and atrial action potentials. 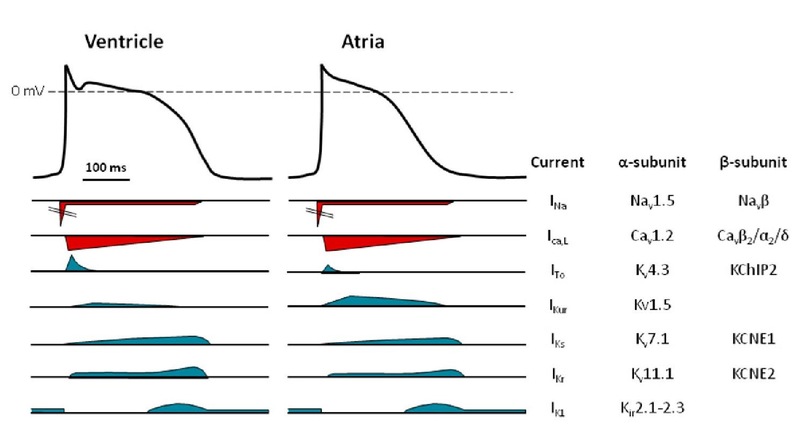 An illustration of the different depolarising (red) and repolarising (blue) currents underlying the action potential in the ventricle and the atria. The current names, together with the major proteins constituting the channels conducting these currents, are listed to the right. The majority of the ion channels responsible for determining the action potential in atrial and ventricular myocytes are the same (Nerbonne & Kass, 2005). However, the relative expression level and means of being regulated differ for several of them (Gaborit et al., 2007). The action potential can be divided into 5 phases (Fig. 1). Propagation and the rapid depolarisation (phase 0) of the cardiac action potential is mediated by a voltage-gated sodium current. Nav1.5 is the predominant a-subunit responsible for conducting the sodium current, but recently several reports have suggested other channels within the same voltage-gated sodium channel family to be important. The fast activation of the sodium channels drives the membrane potential towards the equilibrium potential of sodium – which is quite positive – depolarising the membrane. Partial repolarisation (phase 1), after a few milliseconds, happens due to inactivation of the sodium channels together with the somewhat slower activation of L-type calcium channels (Striessnig, 1999). The depolarising sodium and calcium currents are countered by a repolarising potassium flux. In the ventricular subepicardium, the transient outward potassium current (ITo) – conducted through a multimeric complex with Kv4.x a-subunits – induces a notch in the beginning of the plateau phase (phase 2). In the atria, the ultra-rapid potassium current (IKur) – conducted through the Kv1.5 channels, potentially together with ITo – induces a partial repolarisation early in the action potential. The L-type calcium channels undergo a slow calcium and voltage-dependent inactivation and, at the same time, an increase in the rapid and slow delayed rectifier potassium currents, IKr and IKs, respectively, is observed. This moves the action potential into phase 3. The inward rectifier current IK1 participates in the latter part of phase 3, together with IKr and IKs, in driving the membrane potential towards the equilibrium potential of potassium and thereby terminating the action potential. IKr is conducted through human the ether-a-go-go-related gene channel 1 (hERG1, also called Kv11.1), while IKs is conducted through the Kv7.1/KCNE1 channels and IK1 through the Kir2.x channels. Together with the sodium potassium exchanger 1 (NCX1), IK1 is the current that is primarily responsible for setting the resting membrane potential (phase 4). Several other ion channels, including the KATP channels, the T-type calcium channels, the GIRK channels and the small conductance potassium channels, have been reported to be present in atrial and ventricular myocytes, but a thorough review these channels is beyond the scope of this topic . The primary determinant in depolarising the surface membrane in the atrial and ventricular myocytes is the sodium current. 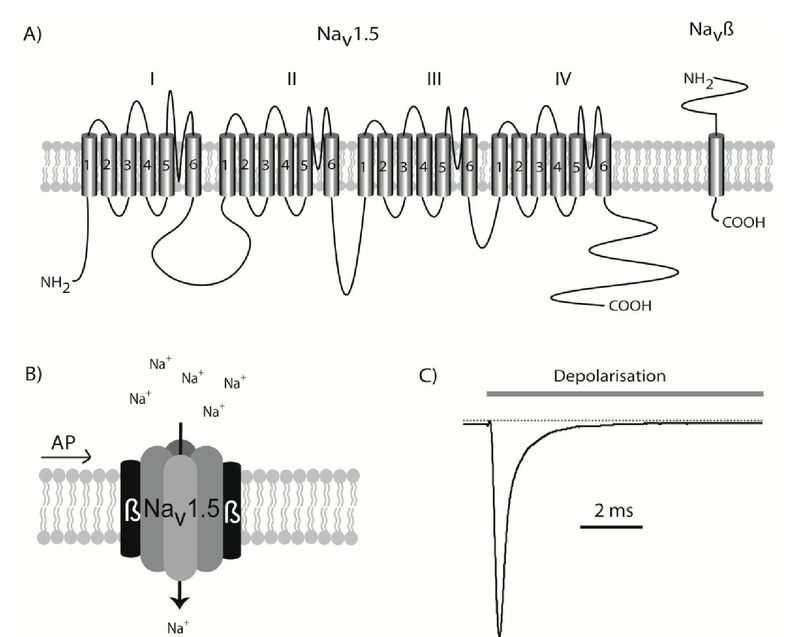 the activation of the sodium channels leads to a very fast depolarisation of the myocytes, changing the membrane potential from approximately -85 mV to approximately +25 mV within 10th of milliseconds (Petitprez et al., 2008) (phase 0, Fig. 1). The sodium channels inactivate equally fast and only a small fraction of the channels are open during what remains of the action potential (Fig. 3). The voltage-gated sodium channel Nav1.5 is the primary component in generating the cardiac sodium current. This is proved by the fact that several cardiac syndromes, including long QT syndrome and Brugada Syndrome, have been linked to mutations in SCN5A, which is the gene encoding Nav1.5 (Jespersen, 2011; Tfelt-Hansen et al., 2009). The Nav1.5 protein is a relatively large glycosylated membrane protein consisting of 2015 or 2016 residues (depending on the splice variant) with a molecular weight of ~220 kilo Dalton (Makielski et al., 2003). The Nav1.5 protein comprises 4 homologue domains (I to IV), each consisting of 6 transmembrane segments (TM1 to TM6) forming a functional channel (Fig. 3). The channel can be found in three confirmations: closed, open and inactivated. Around the resting membrane potential, the majority of channels are in the closed state. When a depolarising pulse reaches the Nav1.5 channels – which are embedded in the cardiomyocyte plasma membrane – the channels undergo a very fast transition, rendering the channels open. Fig. 3. The cardiac Nav1.5 sodium channel. A) The SCN5A gene is transcribed into the large Nav1.5 protein containing 24 transmembrane domains. B) This protein can fold up into a functional channel, but it is believed to be modulated by the Navp one-transmembrane spanning p-subunits in vivo. When an action potential (AP) induces a depolarisation of the membrane, Nav1.5 is activated and a transient influx of sodium begins. C) Illustration of the current conducted through Nav1.5 channels following a depolarising pulse. The channels will activate very quickly, but as soon as the action potential has commenced a fast inactivation is also initiated. After approximately 10 milliseconds, only a small fraction of the channels will be open. This opening is, however, only transient as the inactivation of the channels is also a fast process, beginning immediately after depolarisation and making almost all of the channel complexes non-conducting after a few milliseconds. Although the vast majority of sodium conductance is within the first few milliseconds of the action potential sustained – or late -the inward sodium current is also observed. This sustained current, which is in the range of 5 %o of the peak current, participates in determining the action potential duration, which is illustrated in long QT syndrome 3 patients who have mutations in SCN5A resulting in an increased sustained sodium current (~1-3 % of peak current) (Bennett et al., 1995). In cardiomyocytes with an increased sustained sodium current, the depolarising power of this current will lead to a longer depolarisation time and as the QT interval reflects the ventricular action potential duration, a prolonged QT interval is observed. This sodium ion selectivity is due to peptide sequences located in the pore between TM5 and TM6, while TM4 is involved in the activation of the channel. Furthermore, an intracellular sequence between domain 3 and 4 is important for the inactivation (West et al., 1992). Four sodium channel P-subunits, Navp1-p4, are encoded by SCN1-4B and have been identified (Meadows & Isom, 2005). SCN1-4B all comprise large extracellular immunoglobulin-like domains, a single transmembrane spanning segment and intracellular C-terminal domains. The P-subunits have been found implicated in sodium channel expression at the cell surface, the modulation of channel gating and the voltage dependency of the sodium current. All SCNB transcripts are present in the heart, but thorough investigations of protein expression have not been performed (Gaborit et al., 2007; Olesen et al., 2011). In vivo investigations of the cardiac role of NavPs are restricted to knock-out mice, and the reported in vitro effects inflicted by these P-subunits often depend on the cellular expression system applied; further studies in native settings are needed. However, the fact that mutations in the genes underlying the P-subunits have been linked to a number of arrhythmic disorders (reviewed in detail by Abriel, 2010) underlines the importance of these proteins in the heart. SCN1B is spliced into two variants, P1 (Isom et al., 1992) and P1A in rats (Kazen-Gillespie et al., 2000), and P1B in humans (Qin et al., 2003). While the rat and human P1 proteins have a high degree of similarity, the alternatively spliced part of rP1A and hP1B only shows a 33% sequence homology. In heterologous expression systems, the two most consistent findings with NavP1 co-expressed with Nav1.5 are a positive voltage shift in the steady-state inactivation and an increase in peak current (Dhar et al., 2001; Herfst et al., 2003; Qu et al., 1995). SCN1B mutations have been associated with atrial fibrillation and Brugada syndrome, both of which can be caused by a reduced sodium conductance, indicating that the in vitro observations can – at least to some extent – be translated into a functional myocyte context (Watanabe et al., 2008; Watanabe et al., 2009). In most studies, the expression of NavP2 in various cell systems does not promote changes in the electrophysiological properties of Nav1.5, but it has been suggested that NavP2 is involved in linking sialic acids to Nav1.5, which alters the activation properties (Johnson & Bennett, 2006). SCN2B mutations have been found in patients with atrial fibrillation (Watanabe et al., 2009). The NavP3 subunit is reported to modify a number of biophysical properties – depending on expression system – including both activation and inactivation voltage dependence, as well as reducing the sustained current of Nav1.5 (Fahmi et al., 2001; Ko et al., 2005). SCN3B knock-down mice show a reduced sodium current and a negative voltage shift in steady-state inactivation, indicating that this subunit augments sodium conductance in the heart. The observations are supported by the fact that mutations in SCN3B have been associated with both Brugada Syndrome and atrial fibrillation (Hu et al., 2009; Olesen et al., 2011). The studies performed with heterologous expression systems and transgenic mice have so far been inconclusive in determining the role of Navp4 in the heart. However, SCN4B mutations have been linked to both long QT syndrome and sudden infant death syndrome, as in vitro electrophysiological investigations revealed an increased sustained current of Nav1.5 when these Navp4 mutant proteins were co-expressed (Medeiros-Domingo et al., 2007; Tan et al., 2010).